The New Jersey Devils beat their lottery odds of 11.5 percent Tuesday night, and landed the first overall pick in this year’s NHL draft. But perhaps even more fortunate than the Devils is another team that jumped up higher than their projected position—the New York Rangers, who’ll draft second. With their first pick, the Devils will need to decide between taking 17-year-old American center Jack Hughes, whose hype has steadily grown into mania over the past couple of years, or 18-year-old Finnish forward Kaapo Kakko, who’s seen by most scouts as the number-two but has raised his stock enough recently that in some people’s eyes he’s neck-and-neck with Hughes. For the next two months, the Devils’ brain trust will agonize over this decision and split hairs to determine whether a smaller, pure center like Hughes would be a better or worse fit than a bigger winger with professional experience like Kakko. Every second of these players’ tapes will be scrutinized. Every shift in their upcoming tournaments—the U18 Worlds for Hughes and the men’s Worlds for Kakko—will be dissected. Every word they utter will be analyzed to the point of exhaustion. And in the end, the Devils will still have to make a difficult choice. The Rangers, though? Their scouts can drive up to the Poconos tomorrow, slam endless Long Island Iced Teas all spring, and pass out until they’re on the clock in June. Their decision couldn’t be more stress-free, because the Devils will make it for them. What a beautiful offseason this will be for GM Jeff Gorton. In all likelihood, the Rangers will end up with Kakko, because the rep that Hughes has built up as a U.S. National Development Team stud doesn’t just fade away because a guy starts scoring a bunch in the Finnish Elite League. Every bad NHL franchise has been looking forward to drafting Hughes since he was 16 and put up 116 points in one season at USA Hockey’s program, shattering the record for a player his age by 34 points. The biggest knock on Hughes is that he’s tiny—something like 5-foot-10, 168 pounds, though I’ve heard that teen boys can suddenly grow a lot. But his skills are unquestioned. He’s a smart and unselfish passer who knows how to break a defense, and he’s an absolutely gorgeous skater whose movement on the ice draws comparisons to Patrick Kane. An injury epidemic robbed the 2018-19 Devils of any chance to build on their first playoff appearance in five seasons, but Hughes’s selection would give the team another first-overall center to go with Nico Hischier in 2017. Depending on whether they’ll want to bring back Taylor Hall, who’ll be in a contract year when he returns from knee surgery, or surround their two centerboys with free-agent wingers, the Devils will have a boatload of cap space to utilize as they try to construct a long-term contender. But if New Jersey takes Hughes, the rebuilding Rangers won’t be disappointed with Kakko. This past season—his first full one in Finland’s top league—Kakko set a new record for goals scored by a U18 player, notching 22 in 45 games while also picking up 16 assists. 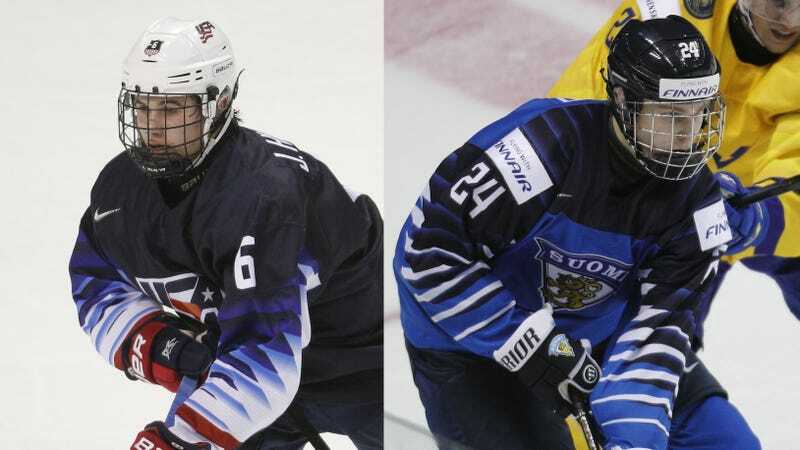 Kakko is four inches taller and about 25 pounds heavier than Hughes, and there’s an immediate power in the Finn’s game that isn’t there with the projected top pick. But like the American, there’s also a maturity and intelligence to Kakko’s play, and that makes it hard to believe he’s just a kid skating among adults in a very good European league. It may feel lazy to bring up Patrik Laine as Kakko’s pro comparison, but when you see a Finnish right winger sending nonstop pucks to the back of the net, who else are you supposed to think of? It’s possible that this draft controversy could resolve itself like others that have come before it, and both players will achieve greatness. But right now, the Devils will have to wrestle with the decision. There might not be anyone in the world who can confidently pick whether Hughes or Kakko is the correct choice. The Rangers are fortunate that they won’t have to overthink it.